The 2008 Spiuk Kronos aero helmet is fully UCI legal and suitable for use in time trial and non-drafting triathlon events. One size fits head circumference from 53-61cm. 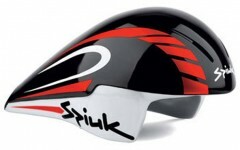 Spiuk COMPACTFIX helmet retention technology allows for millimetric adjustment.